Vanuatu is a "Y"-shaped chain of 83 islands 800km west of Fiji. 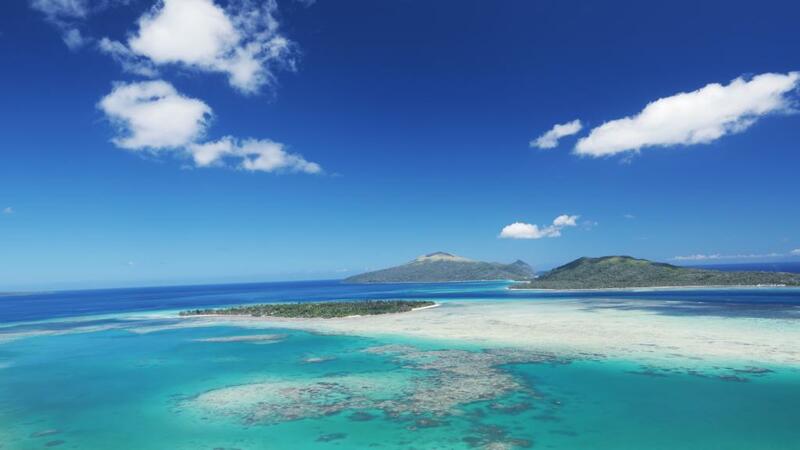 The islands range from towering volcanic cones to others covered in dense rainforest to others which are raised coral islands with wide beaches and deep natural harbours. The Ni-Vanuatu people are a peaceful, loving, gentle race, who enjoy life's simpler pleasures in a country of unique and diverse customs and culture. There are experiences for the traveller not found anywhere else in the world like the Pentecost Land Dive (the first bungy jump) and the Toka Ceremony on the island of Tanna. The international port of entry is Bauerfield, only 10 mins from Port Vila. There is a currency exchange facility as well as bars/restaurants and duty free shops. Departure tax at the International Airport is VUV 2,500 per person (except children under 12 years old), and VUV 400 for domestic Vanair Service tax. Both these passenger service charges are included in airfares. The style of art in Vanuatu varies from island to island, like the customs and traditions. Carving is a traditional art and there are many fine painters, weavers and potters. Handicraft Blong Vanuatu, located in the centre of Port Vila provides a wide selection of authentic handicrafts from many islands of Vanuatu. You will also find handicraft at Art Blong Yumi and Goodies. The introduction of the International Companies Act made Vanuatu one of the most attractive and competitive financial centres in the world. Trading banks are ANZ, BRED, Westpac and the National Bank of Vanuatu. Banking hours are 8:30am to 3:00pm Monday to Friday. The National Bank of Vanuatu's airport office is open for all flight arrivals. Foreign currency is readily transacted and the local currency unit is the Vatu. Travellers cheques or cash are easily converted into the local currency during your visit and can be exchanged when leaving at the airport. The banks will accept most major credit and debit cards and Goodies usually has the best rate for cash and travellers cheques in town. The people of Vanuatu are predominantly Melanesian. The Ni Vanuatu have populated the islands for centuries and with more than 115 distinctly different cultures and languages still thriving, Vanuatu is recognised as one of the most culturally diverse countries in the world. Bislama, English and French are the main languages spoken although there are 115 'mother tongues' in common use. Worldwide satellite communications, 24 hours telephone, fax, email and web access. Phone, telex, fax at the post office and resorts and there's an Internet café in the main street. There are small communities of French, British, Australian, New Zealand, Vietnamese, Chinese and other Pacific Islands people living in harmony with the Ni Vanuatu. Christianity is the predominant religion. Visitors are welcome to attend Sunday services. Many of the shops and markets close on Sundays. Some Chinese-owned shops and supermarkets may be open and, at the resorts, it's business as usual. The kava in Vanuatu is reputedly stronger than its Fijian equivalent, and it is drunk without the Fijian 'clapping' ceremony. The cup should still be drunk in one motion however. Kava tours cost around VT400. 220-230 volts AC, mainly three-point plugs in hotels. There are no dangerous animals or insects in Vanuatu and no vaccinations are required although anti-malarial precautions are recommended for visits to outer islands. The urban water supply is safe to drink and bottled water is also readily available. Please ensure your passport is valid for at least 6 months after your return to your country of origin. Most visitors who intend to stay for less than 30 days do not require a visa. It is a Travellers responsibility to have all documentation in order prior to departure. Foreign cash, travellers cheques and major international credit cards (Amex, Diners, JCB, Mastercard and Visa) are widely accepted. Most shops close for 'siesta' 11:30am to 1:30pm. Restaurants, cafes, banks, supermarkets and the Post Office do not observe siesta. Shops open on Saturday morning and some specialty shops and supermarkets open on Sunday morning. Suburban general stores open early and close late seven days a week. The colourful market in the town centre operates every day except Sundays for flowers, fruit, vegetables and handicrafts. Driving is on the right-hand side of the road, the same as the USA and Europe. Cars, 4WDs and jeeps are available for hire. Taxis are plentiful and are all metered although some may agree to a fixed rate. It is quite common for a driver to offer passengers a comparable rate to the bus. Mini buses offer a frequent though not timetabled service. Look for the letter 'B' next to the front licence plate and simply flag one down and tell the driver where you want to go. There is no tipping or bargaining, it goes against local tradition. A smile and a 'thank you' is tip enough. Mind you, the prices at the souvenir markets do rise on days when cruise ships are in dock, so it's best to put off the shopping for a day if you know one is in town. Travel insurance is highly recommended and very affordable. As they say, if you can't afford the insurance, you can't afford to travel. Find out more about travel insurance.